Allard was the featured marque for this year’s Gathering, with 19 Allards on display, and seven running in Saturday’s Glenmoor Passport Country Tour. Allards present included five J2’s, three J2X’s, three K1’s, three K2’s, a JR, an L-Type, a special coupe bodied M-Type, a Palm Beach Mk I and a Palm Beach Mk II. The Gathering was spread over three days at the Glenmoor Country Club at Canton, Ohio, and included a mouth watering assortment of over 200 cars. 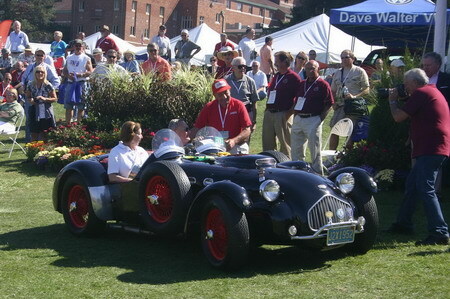 Friday saw the first of the Allards arrive, which were displayed on the lawn in front of the clubhouse with Bruce McCaw’s J2 – winner at Watkins Glen at the hand of Erwin Goldschmidt – taking pride of the place. Also on display were Andy Picariello’s J2 and K2, Tom Kayuha’s K1, the K2 and PB Mk I of Axel & Hanko Rosenblad, Mike Fisher’s K1, Bill Wilmer’s J2X, Bill Boone’s J2X, Paul Schoonmaker’s J2X, Terrell Underwood’s L-Type, Tom Shelton’s J2 and Emil Loeffler’s J2. Friday’s events included an interesting seminar on the trials and tribulations of the Studebaker Car Company, plus the start of the silent auction. A heavy rain shower caused a rush to fit tonneau covers. However it soon cleared and for the rest of the two days the weather was perfect. The Glenmoor Passport Country Tour commenced at 8 AM on Saturday morning. A total of 40 cars took part in this truly unforgettable 90-mile tour through the rolling hills of northeast Ohio, over two lane country roads shared with Amish horse-drawn buggies. The seven Allards participating were Tom Kayuha and Mike Fisher in their K1’s, Axel & Hanko Rosenblad and Peter Bowman in their K2’s, Tom Sheldon driving his J2, Paul Schoonmaker in his J2X and Terrell Underwood piloting his L-Type. The first stop was at Carl Maxwell’s Sinclair Service Station in Berlin, with lunch being taken at the recently restored Canal Tavern in the quaint historic village of Zoar. The Tour included a special slalom section where drivers had to dodge Amish Buggy "debris." Sunday was Concours day. Being the featured marque, the Allards were not a part of the main Concours. However all 19 Allards were subject to their owner’s voting for the best ‘road car’ and ‘competition car’. Judging was to be completed by 10:30 am, and before the awards were made the Allard exhibitors attended lunch on the patio. During that morning, Palm Beach Mk II owner Robert Hartson gave a demonstration of how to ride a ‘penny farthing bike’ – very impressive when ridden in a relatively small area! 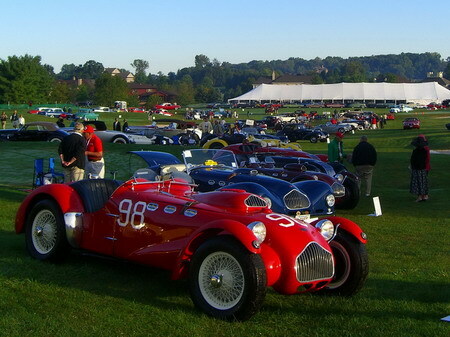 The Gathering produced a fine field of Allards – thanks to all the hard work of Andy Picariello and Tom Kayuha. UPDATE from David (Oct 21): I would like to apologise to Bill Magavern for omitting to include not only him, but his K type from my report. 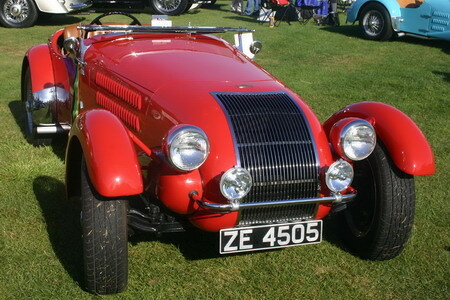 His K type has cycle wings along with a representation of the original Allard grille, which can best be described as a work of art.